TSP Regalis is a new (2016) rubber from TSP made in Japan designed for use with plastic balls. Unlike the latest generation of most Tensors or tensioned rubbers that tend to have a high catapult causing loss of control, the Regalis are very linear, offering high speed that varies depending on the effort you put into it. It has extremely high grip giving very high spin potential. This helps to negate the lower spin potential of the new plastic balls. Below you’ll find reviews, including some completely independent ones from members of OOAK Forum, of the TSP Regalis rubbers. 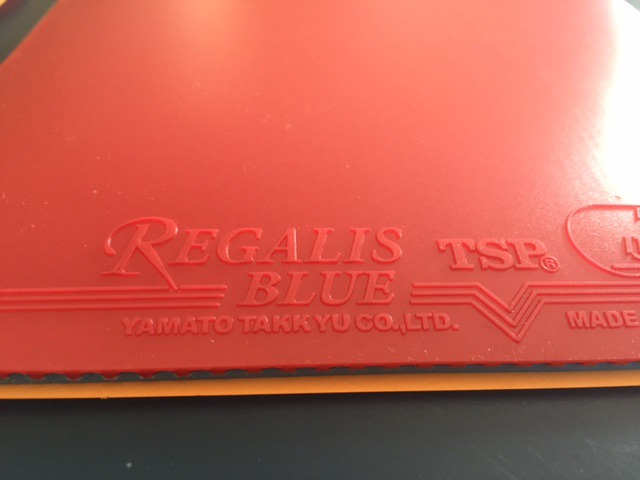 TSP Regalis is a new Japanese rubber innovation featuring great spin potential and integrated Dynamic Tension Technology. With its extremely tacky top rubber sheet and the typical playing features “Made in Japan”, TSP Regalis fits in seamlessly in the series of Japanese Spin Classics. 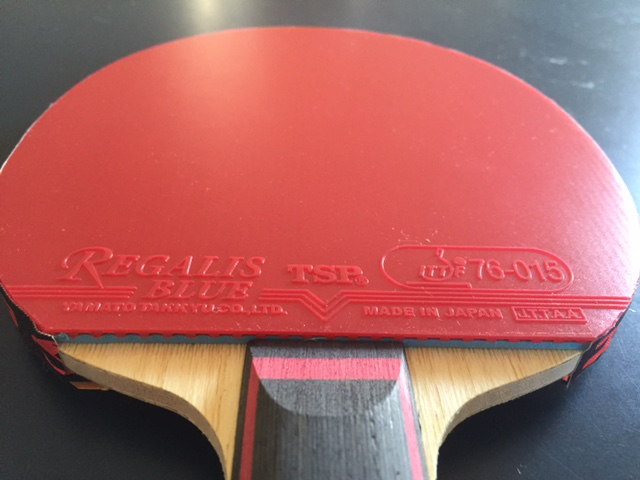 Regalis Red combines the legendary Japanese spin features with a red medium OFF sponge with integrated Dynamic Tension Technology. 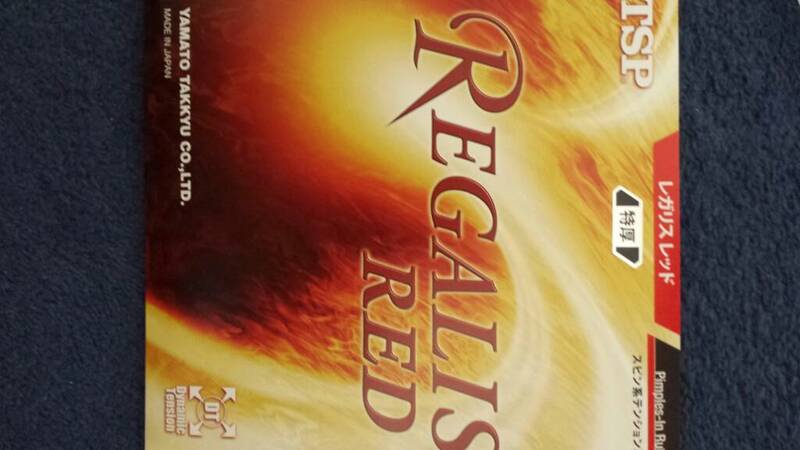 Regalis Red is a real OFF Classic with convincing catapult effect, great spin and forgiveness. A genuine OFF Classic made in Japan for a feel just like in the good old “Speed Glue Times”. Made in Japan. The rubbers look and feel very high quality. The blue clearly has a harder sponge, which you can easily feel by pressing it. As a guess I’d say the blue is similar to Tenergy 05, the red similar to T05 FX. Topsheets look and feel similar, with a bit of a shine, and very grippy. Weight wise the blue has similar high weight to the many of the new generation rubbers like Tenergy, while the red is clearly lighter. Took a while to get here. Canada post seems to drop packages into the pacific and let the tidal forces drift them into shore. But this is the review for TSP Regalis blue in max that Haggisv has graciously sent me for testing. First let me set some parameters. I am a defensive player who chops with LP on the backhand although I could tell you my equipment it truly doesn’t matter. My level has varied quite a bit due to injuries but as far as technical skill goes, my forehand loop would be in the top 50 of my country and my forehand chop would be in the top 2. It is difficult to comment on the amount of spin that a rubber can generate because there is so many factors that play into it. For example looping style, serving style, power of forearm, grip style etc etc. I will say that this rubber provides more then adequate spin to achieve anything you desire in a table tennis shot. I can however comment on feel. 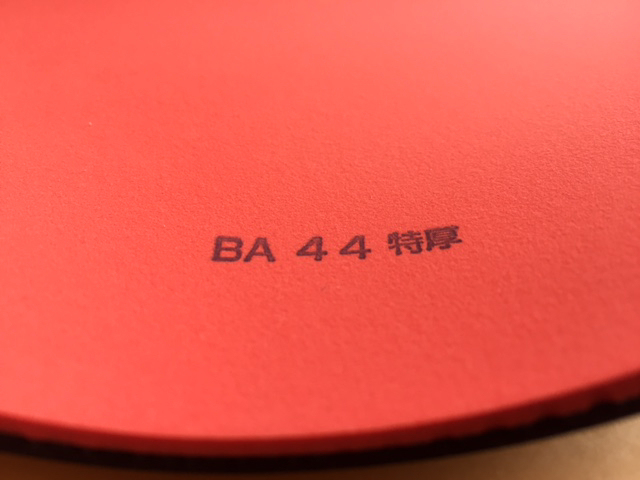 The rubber is very high quality mechanical grip. It is hard by Japanese and European standards but very soft by Chinese standards. Slightly porous sponge with pores similar to that of Tenergy. With adequate force applied to the ball it has a very very good catch and release feel which helps me gain control. I find tensor rubbers have this catch and release feel as well but this one requires more energy input however you always achieve more spin and speed as an outcome. Probably because of the harder feel. This rubber feels much more Tenergy like then tensor rubbers. As far as chopping goes you will not experience the dead feeling that you get from a pure chopping rubber, it requires a proper stroke and not just a hack and almost the same catch and release feeling as looping (although shorter). Sometime I played game where I am determined to chop everything and dead chopping rubbers help lots in this situation however sometimes I play a game where I choose to chop only when I’m perfectly ready as I know the resulting ball will be difficult to perform but very effective if done correctly. This rubber is the latter. Blocks and fishes and counter loops are it’s bread and chopping is it’s butter. I would comment on the loops however I have passed the rubber to my coach to test out at a professional level. hanks to Alex for the opportunity to test this. This is the softer variant – I think I read 40 deg sponge somewhere? If so that would be along the lines of the tensor scale. It feels to me (by touch, not play), a little harder than victas v15 limber which is noted also at 40 deg. Domed out of the packet….this made it a little tricky to glue. It didn’t smell heavily tuned though, unlike the Tibhar Evolution mxp on the other side that still reeks of factory booster weeks later! Topsheet and sponge look top quality, no blemishes at all and just a light sheen to the topsheet. 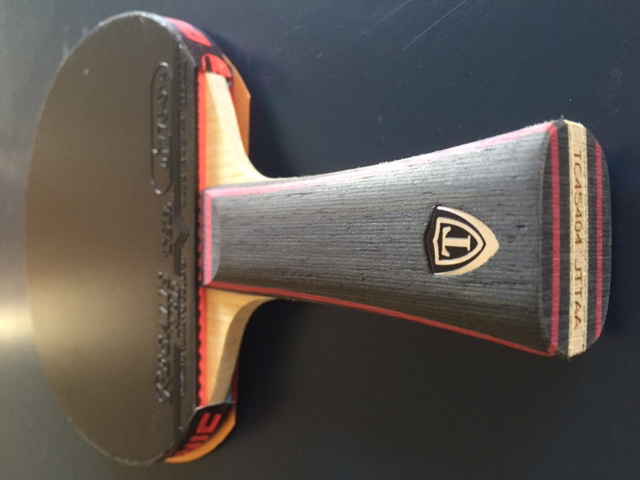 It feels very grippy, no stickiness, and overall feels medium-soft to the ‘squeeze’ test. a chance to have a hit with it, probably Sunday. I have now had four decent sessions with the Regalis Red, including 3 hours yesterday. 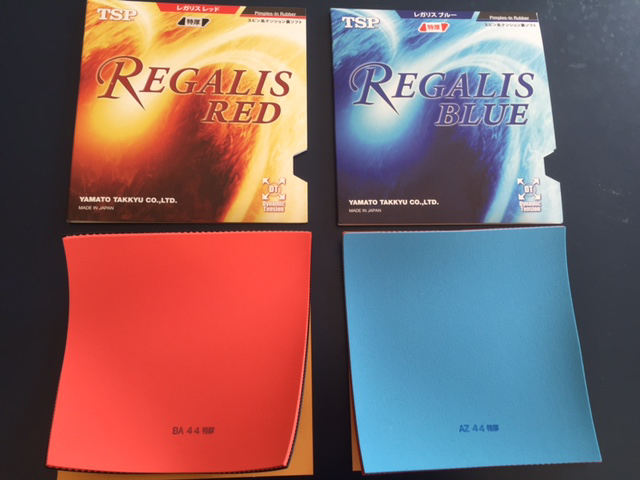 This soft version of Regalis is for me a backhand rubber, and the reference rubbers are Victas V15>limber. (also 40 degree sponge) and Rakza 7 soft. Generally I use 2mm on backhand so I wondered if I would have an issue with max, but here is the strange thing. It looks and to me also plays like a very thin max. I have Tibhar evolution mxp (2.1-2.2mm – Tibhar use a range) on the other side of the bat and that looks thicker. Other testers, does yours also appear the same? First up it has a lowish throw for this type of rubber. This is a key characteristic and defines the rubber. Certainly lower than the v15 and rakza. It is also more linear than the other two, with a lesser catapult/bouncy effect in the short game. I really like both of these properties, as once you adjust to having to give the ball a little more ‘air’ it becomes a very safe rubber (for an offensive rubber of this type). I should say that the short and serving game spin is very good indeed, especially service. Short, spinny backhand serves, even off high tosses (this is a tactic I like to employ to fool opponents that I am going for a long serve!) were consistent and loaded. Even plain backspin variants were catching out players who play me regularly. Moving into the world of topspin, this is a good and thoroughly competent rubber. I have been struggling to work out whether it is just giving a glue sound (click/crack!) or whether it is bottoming out on harder shots. Whatever, it is somewhat loud. I suspect the latter as earlier this week when we did some fishing vs ‘put away’ practice, where I always play forehand, I flipped the bat and didn’t bottom out. R7 soft and v15 limber would have done. Spin in the topspin environment is very good without being exceptional. It is however a very safe and consistent rubber. Blocking is just superb! Blade angle needs to be sufficiently closed but it just soaks up the spin and speed and sends it back. So what’s not to like? Well, it seems quite sensitive to spin in the short game. Once the sponge is engaged this is not the case, so blocking or topspin to topspin is fine. Also, although quick there are faster options out there. It is almost a half classic/half tensor option. It is linear and rewards committed strokes. After a few sessions it is unmarked and unchipped. I like it lots and it is now my main BH rubber. In summary, v15 limber (V) vs rakza 7 soft (S) vs Regalis red (R)…. Durability …. Too early to sure but R and V look best, S is prone to chipping. 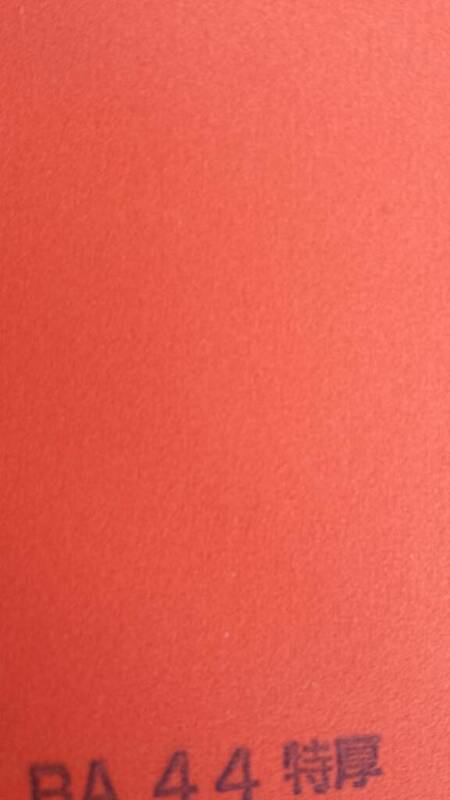 Ok, here is my review of the rubber sheet that Haggisv sent me to test. 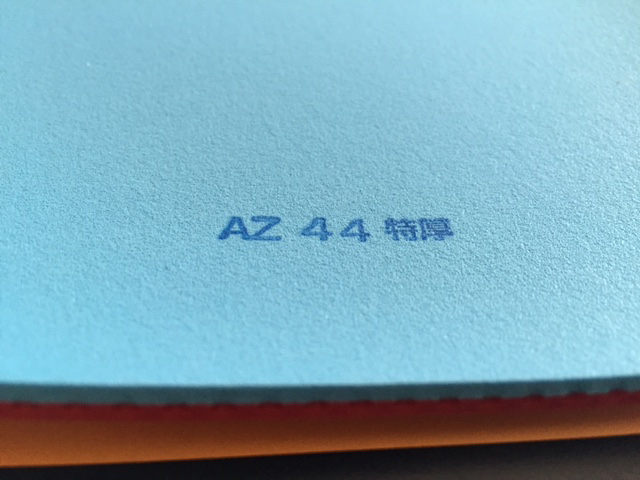 Sponge: 48 degrees (blue colour). Opening up the packet the packaging had a feel of quality about it which was backed up when I got my first look at the sheet. Its blue sponge is quite different looking to others I’ve seen and was rather striking. 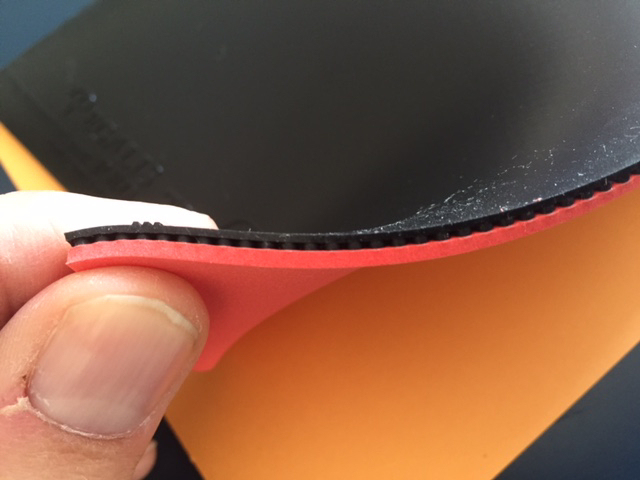 The topsheet had a nice sheen and a look of quality rubber with its fine texture. I mounted it to my blade (with Stiga Optiimizer Water Glue) and gave it a hit against the robot. Initial feeling was quite similar to Rasant. FH loop drives were virtually indistinguishable to the Rasant which I was alternating on the robot with. I took the review setup and the comparison setup to the club last night for my usual Monday night pennant. I used the Review Setup for an extended pre-matches hitup with a looping player I am familiar playing with using my regular (comparison) setup. And more importantly he is familiar with my shots. I will discuss my results shortly, but I was sufficiently impressed with the rubber to play my first singles match of the night with it. The rubber’s speed seemed to lack a little from the Rasant speed I am used to. The Rasant has been in use for at least 12 months. I do tend to get longer out of inverted rubbers than most as I play 80-90% of my shots from the BH pips. but the Rasant does show quite some signs of wear still. I would estimate this Rasant is hitting at 85% of the speed of a new Rasant sheet. Taking this into consideration the Regalis was probably only 80-85% of the Rasant’s speed. So possibly up to 30% slower than a new Rasant, which is obviously very subjective, but my hitting partner confirmed it was significantly slower than my usual FH drives. I will qualify this finding with the way I found I needed to hit with the Regalis vs. Rasant. With Rasant I can hit directly through the ball imparting topspin to a fairly flat trajectory ball that clears the net and drops onto the deep table. With the Regalis I found this shot was finding the net, and so I had to adjust to give a little more lift on the shot, which probably had the effect of reducing the power and increasing the spin. However, it was still clearly not as powerful as the Rasant. In comparison to the used Rasant sheet, the spin of the Regalis was greater. My hitting partner confirmed this. However, I know when I have opened a brand new sheet of Rasant, the spin I can impart on the ball is crazy. Far, far more than I could create with the Regalis brand new. This is not to say the Regalis spin is bad, it is not. The crazy spin of Rasant soon dies off with a few weeks of use down to its then normal level. Given I don’t ask a huge amount of the spin an inverted rubber can provide in my normal game style, this is not a big issue to me. Whether the Regalis spin dies down with use remains to be seen, but I get the impression it will probably be about as it is now for its useful life, which is a very serviceable spin level. 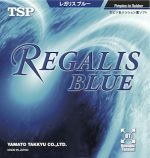 The feel of the Regalis is what I’d describe as a medium-soft feel. No where near a mushy feel, but not as crisp as the Medium Rasant feel (which I think is the reason for its reduced speed). I don’t recall the sponge hardness Andro label Rasant with, but it may be something like 42 degrees (but it may be 45). Sponge hardness is notoriously different between companies anyway, but I’d say TSP’s 48 degrees in comparison to something between 42 and 45 feels about right. And besides the issue I had with adjusting my stroke for hitting with it, I found the rubber still felt like I had control over the ball and felt solid in play. Of course, a lot of this also has to do with blade feel coming through the rubber, but you know when a rubber feels “off” on your blade. If you like a rubber that’s fairly forgiving and not so hard that it pings loops long all the time, then this may suit you. Whilst this rubber is not so soft that it becomes a blocking machine, but good for little else, the blocking ability of this Regalis was right up there. I’d say slightly easier to block with than the Rasant. Rasant is not too forgiving of getting the blocking blade angle very far wrong, which I am acutely aware of as its ones of my key defenses against loopers and drivers to my FH side. The Regalis is somewhat easier to block with, but also nothing like Roxon 330 which is an absolute blocking monster, but not much good for anything else. Overall, I’d assess Regalis as a very capable rubber probably more suited to a placement looping game (although a good powerlooper may find it fine too) than an all out power-hitting game (which would be exactly how I’d describe T05 btw, although I don’t think Regalis has quite the spin level of T05). Durability is a question mark given how short a time I’ve played with it (or even how short-timed the rubber has been out in the market). I didn’t feel confident enough in the rubber to play all my matches with last night. I only lost the first match 11-7 in the 5th set, to a player I’ve never beaten before. However, there were a couple of FH drives that I missed (which I may have missed with Rasant as well), but given it was the first time I had used the rubber I retreated to the “safety” of the known Rasant. I won one and lost another match with the Rasant for the rest of the night. I will be giving further trials to the Regalis from here to see if I can learn more from it. I will report, in this thread, any findings that differ from what I have written in this review. I’m a classic defender, and play with a 2.0mm tensor in Omega IV Asia. (You don’t see it in my sig, because I’m trying out the thin 1.0mm Triple spin chop again because I modified one of my Defplays). I’ll also compare the rubber to Vega Asia, Tenergy 05 and 80 for reference. I tested the rubber on 3 blades, the Defplay Senso, the Joo Se Hyuk, and the Stiga Allround Classic Carbon. The first 2 had P-1R on the BH, and Stiga had Vega Asia. 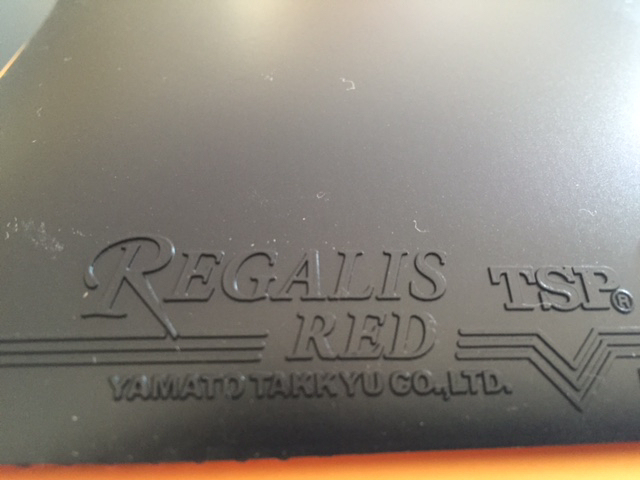 When I opened the Regalis, it was obvious that this was a top-quality sheet of rubber. I noticed no tuner or anything like that. Glued up easily and didn’t soak up too much of the glue during application. I first tried the rubber on the Defplay and then on the Joo blade for comparison. Topspin strokes were all very controlled and felt very “Tenergy-like” for lack of a better descriptor in terms of feel, dwell, but less bouncy. I’d describe the throw angle as medium whenever the sponge is engaged. Looping and driving strokes were all very medium and predictable. Very linear. When brush-looping you could really spin the ball, and the throw is higher but not overly so. All and all, this is a very linear, controlled, not-too-fast/not-too–slow rubber: just right (as Goldie Locks put it). If you are an attack monster you might feel like the “umph” is not there with a slower blade like the Defplay. On the Joo and Stiga, the rubber has all the umph you could ever want. Pushes were very spinny, and performed similar to Omega IV Asia and Tenergy 80 in terms of spin. However, it felt slower and safer than the other 2, so you could really dig in to those pushes without as much fear of pushing long. Played very similar in this regard on all 3 blades. Chops were amazingly controlled for a MAX rubber. I think the reason I liked it is that the sponge is harder, and less bouncy. I actually prefer chopping on the FH with faster harder rubbers, and this fit the bill perfectly. Everyone says max rubbers are hard to chop with, but due to linearity of the sponge, and the hardness of it, the Max thickness wasn’t so mushy or spongy, and the decreased dwell gave it more control. By “control” I mean keeping the ball on the table (not manipulating the ball). To me, 2 things add control in inverted chopping, slowness, and less dwell (just like LPs do). Too much dwell causes the ball to sink in too much and thus be spin-sensitive (especially to sidespin). Too much speed or bounciness makes the ball sail unpredictably at times. But the slowish speed of the rubber on passive strokes + the hardness of the sponge , made this rubber seem really nice for FH chopping. Chopping was equally controlled on the Defplay as well as the Joo blade. Far less bouncy then either Xiom. Slower, but not too slow. 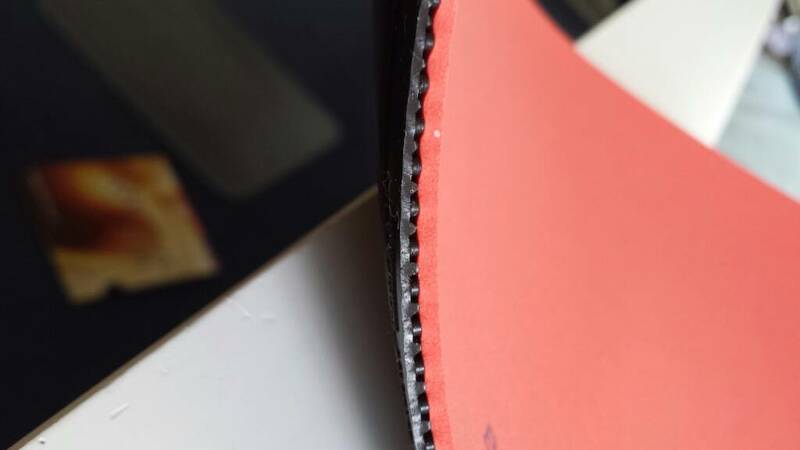 Blocking is arguably the best feature of the rubber, especially on the Joo and Stiga blades. It’s very predictable, and because it’s not too bouncy drop shots are easier to perform than with other tensors of the same class and speed. By adjusting your grip pressure, the range of speed you can impart is wide. The max sponge really kicks in when you change your grip to hard at the point of contact and the blocks are nice and aggressive, but under control. Light (toothpaste tube) grip really facilitates those hated slow drop shots to the wide angle. As far as blocking is concerned, I can only liken it to Tenergy 80…but slower and more linear. Very forgiving of passive blocks. It is the exact opposite Omega IV Asia which blocks high and is very bouncy. The lack of bounciness and speed really makes this a very good serving rubber. As good as Vega/Omega Asia and Tenergy 80, but with less risk when you really go for it on serves. It doesn’t spin as nicely as the Omega IV Asia which has a grippier topsheet. 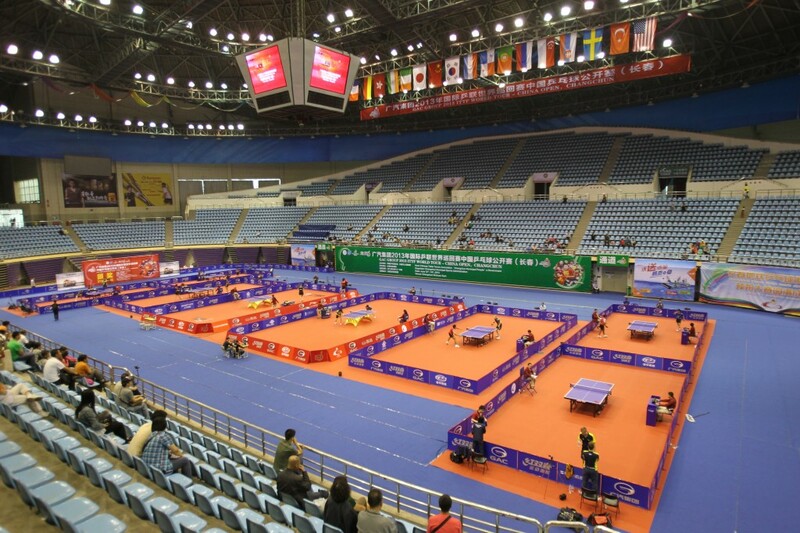 The reason why it excels here is that it’s not too fast and serving short is easy. Also, in terms of grip, the rubber didn’t react poorly to the recent insane humidity we’ve been having. I actually wish I hadn’t cut it to the Stiga blade’s head size because I’d like this for my Modern D setup on the Defplay. A max rubber that attacks well, but still chops well is very hard to find, at least hard to find with few compromises. I’ll probably be ordering another sheet for that very reason. This will also remain on my double inverted setup. I hope that my use of the word “Slow” doesn’t give the impression that this is a slow rubber, it’s not. It’s fast enough however it is very blade dependent (What rubber isn’t). IF you like T80 but want a little more control and a little less speed, this is your rubber. I also took the liberty of letting some others try the rubber out (Including Der_Echte) to get their impressions, I’ll post those later. I like Regalis Blue a lot! 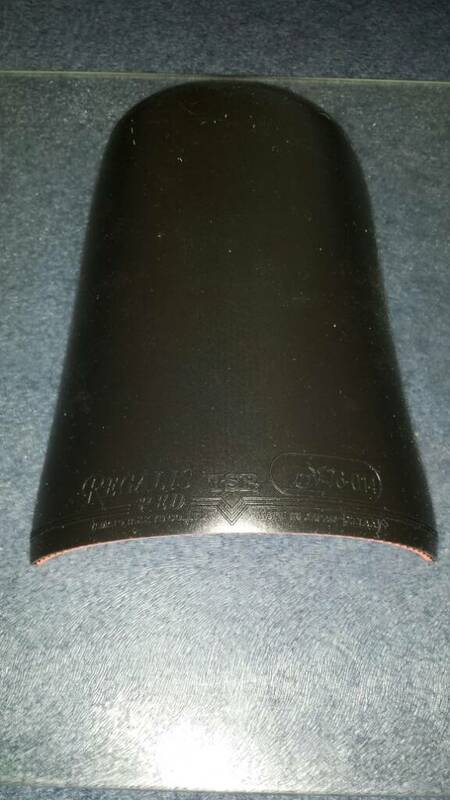 It’s placed as forehand rubber nr.1 for the upcomig season on my NSD blade. Fast enough for looping, good control on block and chop, hard but not “dead” like chinese rubbers or to heavy on oversized DEF blades. The maximum spin level is sufficient too. Its characteristics are somewhere between Victas 401 (ESN sponge, harder and higher weight) and Tenergy64 (faster with higher catapult and less control) which I played before. Definitly very usable for moderne defence with powerloops and chopping. Regalis latin meaning is “royal”, so it seems to me they tried to combine the best of different worlds. You have to play with it a few sessions to see its full potential. More linear than ESN, not as “dead” as chinese rubbers, easier to play than all Tenergys… high end for the “average joe”. 1.5mm sponge of my testrubber has 1.7mm for real. The 2.0mm version comes in 1.8mm remeasured so I think the difference is negligible. I just wanted to say that I continue to use this rubber and find that it is the friendliest rubber to use. Not too fast for beginners. Not too slow for 2400 level loopers. Linear without slowness. You have to hit with it to see what I mean.